We’re sitting on the veranda at Voi Wildlife Lodge, looking northward into a shimmering expanse that the old colonials used to call MMBA – ‘miles and miles of bloody Africa’. Soft voices drift out of the dining room behind me. Hushed conversations in Italian, German, French, English and Swahili. Eyes rise from plates and swivel over the rim of glasses to the hypnotic landscape. A mixed herd of eland, impala and waterbuck are nibbling at the grass around the watering hole. A herd of 27 elephants have already quenched their thirst and moved onward and the lions that tried to bring down a big buffalo right in front of the lodge last night haven’t shown their faces this morning. It’s fair to say that we’re scanning that sunburned horizon more intently than most of the tourists behind us. In just a couple of hours we’ll drive out from here to begin a crossing of one of Africa’s greatest wildernesses. Tsavo National Park is roughly the size of Israel. It’s a legendary land, once known for its man-eating lions and vast herds of elephants. Happily, the elephants are on the path to recovery after the poaching horrors of the ’70s… and the local lions seem to have lost their taste for two-legged prey. We’ll have enough to contend with in a 200-mile bush-trip through predator country in a classic Land Cruiser that’s almost as old as I am. We’ve re-provisioned now with a fridge-full of Tusker beer and enough sausages and steak to last through a week of campfire barbecues. 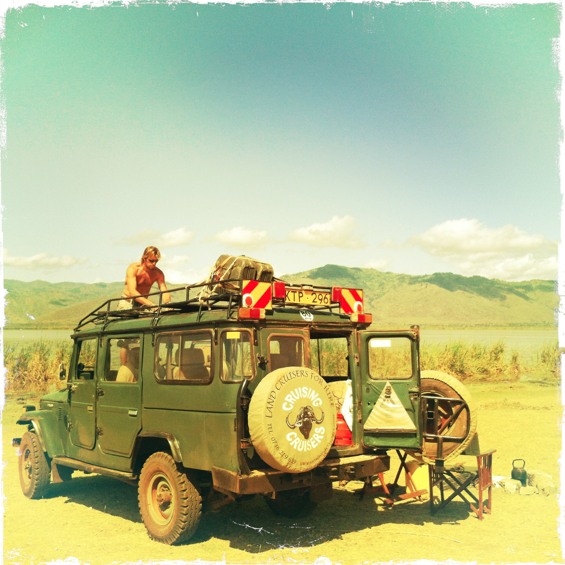 We have two extra jerry-cans of petrol strapped onto the roof and a bottle of Cardiff gin and another of Safari rum. By the time you read this we’ll be happily rolling through the heart of Tsavo… or perhaps camped beside a muddy sump-hole digging and swearing. We’re just popping out for a drive. Might be gone for some time.